The Mastiff...... videos - This Forum is brought to you by The Mastiff Sweet Spot and Friends of the Forum. I might add, that Miguel Angel Sanchez referenced this site and deserves credit for the find. Was waiting for a chance to use this!!!! LMAO!!!! Thanks for the looksee...very nice...great examples of the breed shown. I know Erika, but it is new to U- Tube and Miguel posted it to the Mexican Mastiff boards. Nice to see you are still playing Gotcha! I'm not sure how I missed it. Great video and one that should be watched by all. I believe this videos are good assets to this WORLD Mastiff forum, only few kennel clubs (canine federations our associations) in this planet, produce visual standards. Thanks Steve. Darius, at 8 months 1 week, playing his favorite sports: golf and tennis. What did you expect? 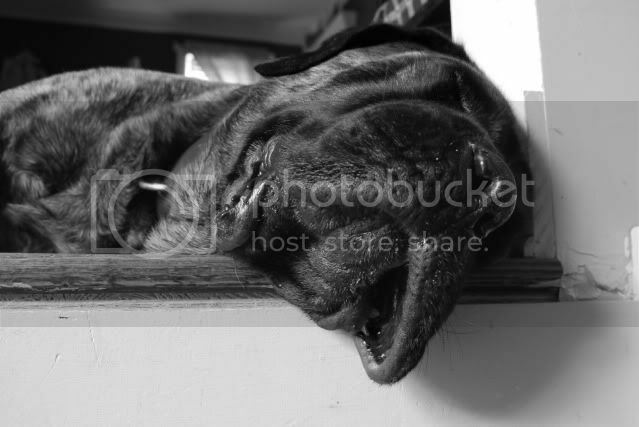 After all, he's an English mastiff!